If there's one thing the world desperately needs right now, it's a book that serves as a rallying cry against the wave of crypto-fascism that's sweeping through the modern Left. Sadly, "What's Left" is not that book. I follow Mr Cohen on twitter, and he's often on the mark with the things he says. Sometimes, yes, a bolt flies wild, and maybe even hits an innocent bystander, but that's politics, isn't it? However, reading this book leaves one feeling a little like someone in Simone Weil's unit in the Spanish civil war. Ms Weil was a courageous and committed human being. Like Orwell she volunteered to fight fascism (and frankly I, and I suspect most people, wouldn't volunteer for any war, and as a woman Ms Weil was not expected to, yet she did) but she was cursed with very poor sight, and her comrades discouraged her from weapons use for fear she'd hit them, rather than the enemy. So it is with Mr Cohen's book, largely because I fear he's not clear on who the enemy is. At the outset one should recognize that it takes bravery to write a book like this. I don't think Mr Cohen is entirely of the political right, which means that he's in the position of alienating friends and colleagues by writing something like this. It seems to me he's center-Left, but that's a position where you can be ruthlessly attacked by those further Left, and your center-Left compadres will tend to look the other way. Writing something like this gets you death-threats and denouncements and people spreading lies about you. Also this book was written in 2007, and things have gotten worse since then. Perhaps in 2007 it was clear that something was happening, but not yet clear what manner of thing it was. Certainly, in 2007 I had no idea what was happening to Left-wing politics. No-one had yet denounced me for 'privilege', told me that my gender or the color of my skin invalidated my opinion, or called for my execution to the applause of supposedly 'Left wing' middle-class gallery. Largely because of my class background I still lived in a world where the old working-class Left opposed racism, sexism and moral exclusion, I hadn't mixed with the new-Left bourgeoisie who are fighting so hard to make these things respectable again. Perhaps then this book has dated as so many of us have had personal experience with the new ideology that's eating the Left. I should declare my own biases here. I no longer identify as 'Left wing' though I would have once, but now I'm someone who is deeply suspicious of what the Left is becoming, and I'm frankly nauseated by the opinions expressed by the radical Left, many of whom seem to me to be fascists hiding in someone else's stolen clothes. I mention this because what's going to follow is likely going to seem like a staunch defence of 'the Left', but I would far rather be reviewing a book that had successfully diagnosed all that is wrong with what I call the 'new Left', the self-serving academic, bourgeois insurgency that is taking over a politics that once sought to speak for the common people. The first major flaw of this book is that it treats 'the Left' as a monolithic block. Mr Cohen will deny this, because he makes occasional nods to the fact that there's a number of subgroups, like for instance the old, working-class, socialist Left. However, I think he'd agree that if I were to open an argument by saying "not all Jewish people are involved in a conspiracy to take over the world" but then spend pages and pages ranting about "The Jews, they're everywhere, and behind everything! ", then there'd be something disingenuous, or at least poorly thought out, in my later claiming that "No, of course I didn't mean *all* Jews, just some." I realize though that finding language that clearly identifies the problem subgroup can be difficult: but it is a challenge that needs to be dealt with. This is why the term 'Islamist' has come into fashion, because it allows one to identify a subgroup without one's barbs hitting all Muslims. I imagine that Islamists want to reject the label for precisely this reason: it allows them to hide in the moderate majority. Extremists on the Left play the same game, rejecting any label that would allow them to be identified as a subgroup, and claiming that they are, for instance, "feminists", so that they can hide in a larger more moderate majority and let that majority take the brickbats for them. But someone writing a book on this subject needs to take this bull by the horns. If the book is to be a rallying cry, then some thought has to be given to who it's rallying, and I can only think that the target group is the moderate Left. There's little point writing a book denouncing the Left to those on the Right, because the Right already views the Left as evil or hopelessly misguided (and every day it seems that reality is inching towards their viewpoint). But as a battle-cry for the moderate Left this book is a failure, and many of them will feel Mr Cohen is attacking them, not rallying them. Another issue of language is the use of the world "Liberal". The new Left is as anti-liberal as it's possible to get without engaging in mass-murder. The new Left seeks to implement an Orwellian regime in which language and behavior would be controlled and legislated down to the most minute levels. Many people who oppose this describe themselves as 'liberal', so in using this term to describe the 'Regressive Left' Mr Cohen's scattershot is hitting his potential allies as often as the enemy. Furthermore, Mr Cohen's mistake here extends beyond mere language. He frequently cites people or groups as being "The Left" because they support a particular position. Some of his examples of "the Left" will raise eyebrows: for instance, the claim that Richard Dawkins, because he opposed American adventurism in the Middle-East, is an anti-American Leftie (at least, I think that's how he's being presented, if not then why is he introduced to the argument at all?) will have many people in fits of laughter. Again though, perhaps this is down to the book being written in 2007, before Mr Dawkins was on twitter and expressing his anti-Muslim views very loudly. I should say here that I don't consider Mr Dawkins to be any better or worse than most people: I think some of his statements cross a line, but then so do those of most people I encounter online. If twitter has shown us anything it's that if there's anything that's common across all human beings and all political viewpoints, it's hatred and bigotry. At least Mr Dawkins does not, from what I've seen, call for the extermination of any group of people, even in jest. I've unfollowed a lot of people, particularly on the 'progressive' Left, for doing just that. But the point is, most of the 'new Left' hates Mr Dawkin's guts, so it's a little strange to see him advanced here as an example of left-wing lunacy. Another example of poor target-acquisition lies in how much of a book is an extended rant against those who opposed the Gulf wars. In an afterward, Mr Cohen complains that he got criticism for this when he'd clearly said that he accepted that the opposed camp was right on many points. Well, again, though he uses the 'right on many points' line at places in the text, he nevertheless devotes chapters to "the Left's" opposition to the Gulf Wars being an example of their moral bankruptcy. He even has a chapter entitled "The Disgrace of the Anti-War Movement". He can't have it both ways, they're either right or they're wrong. Worse, he fails to grasp that many people were opposed to the second gulf war for a great many reasons. Not everyone who opposed Gulf War II was anti-American, and some of them had likely supported Gulf war I. Very many of them, including myself, opposed Gulf War II because we didn't trust the narrative that our political leaders were feeding us, and we were skeptical about their ability to deliver the 'better Middle East' they promised. Indeed, many of us feared that further meddling in the region would 'destabilize' the region. At the time we were told "How could things possibly get any worse?" Years later we have the answer. History has vindicated the anti-war lobby more totally and more horribly than they could ever have imagined. To read someone railing against them now is like reading a passionate argument that we should be burning more witches. But again, perhaps this is the benefit of hindsight that in 2007 we didn't have. However, by attacking the anti-war lobby, Mr Cohen is attacking a vast swathe of people and political viewpoints, not all of whom would even identify as Left-wing. This decision on his part is going to get a lot of reader's backs up. He later focuses on the failure of 'the Left' to support the rebuilding of Iraq. This misses another important division: that of class. The Gulf war was a major event in western life that no-one could be ignorant of, and everyone had an opinion on. Thus all manner of people, from hairdressers to university professors, turned up to anti-war rallies. However, the rebuilding of Iraq after the war was a thing discussed in the corridors of power and guest lectures at LSE. It was not much discussed in the press. The majority of people, of any political persuasion, would have been locked out of it. Iraqi civil-rights groups seeking support of the western 'Left' would find themselves speaking mostly to the western intelligentsia, and that's where I feel that things started to go wrong. However, again, there are other factors in play here. Iraq was, in many ways, a closed state, and if people didn't denounce Saddam as Mr Cohen says they should have, this might be because many of them were ignorant of what had been going on within the country. This was a state that we'd effectively been backing during the Iran-Iraq war, back when the Ayatolla was the enemy (except during Iran-Contra when the US and Israel were secretly supporting Iran ((Unless that was a ruse in some larger Xanatos Gambit that we peasants aren't privy to)). Now, suddenly, we're told that "we have always been at war with Eurasia" and that the Iraqi regime is utterly evil. Let's not forget that we're being told this by governments, our own governments, that have prior form when it comes to lying about the situation in the Middle East (Suez and the overthrow of the democratically elected Iranian government being two major cases). Why would you expect anyone to trust what we're being told? People on all sides of the political spectrum were, and continue to be, punch-drunk from a neverending stream of lies and scandals emanating from our governments. The only thing we're sure of is that we can't trust our government's foreign policy. Too much of this book is devoted to what appears to be an attack on a position that history has proved right. We are often told that we should attack an argument where it's strongest, but this advice only applies of you can discredit it where it's strongest. It's a mistake to attack an opponent at a point that you can't overcome, and a double mistake to attack a position that is held by many of your potential allies. The situation in the Middle East seems to be a personal hobby-horse for Mr Cohen, which you can't blame him for given the appalling slow-motion genocide that the region has been for as long as I can remember. However, it's a quagmire on many levels, and it was a mistake for Mr Cohen to drag his argument into it. Another problem is that Mr Cohen tends to contradict himself. In a section where it would seem he *is* recognizing the variety of viewpoints behind the anti-war case, he discusses Ariel Dorfman's position, which he says "summed up the fears of tens of millions". Mr Dorfman worried that "War would destabilize the Middle East and recruit more fanatics to terrorist groups," but also recognized that Saddam's regime was evil. Mr Cohen seems to approve of this position, but then goes on to say, "I don't think any open-minded observer who wasn't caught up in anger could say that Dorfman was typical". But he's just said that Dorfman's position "summed up the fears of tens of millions." Just how many people do you have to think like in order to be 'typical'? He contradicts himself again in Chapter 11, "The Liberals go Berserk", in which he makes a case that a judge must be impartial to politics and view a case solely in terms of the law. Yet, only a few pages later, he's outraged at an 'eminent liberal QC' who said that pictures of Saddam Hussein in his underpants were a breach of his human rights. Well, if that's the law, then that's the law, and by Mr Cohen's own argument of a few pages previous the QC is right to speak as he did. Another issue is Mr Cohen's tendency to attack people, rather than ideology. People are, unfortunately, largely irrelevant in the debate over what's happening to the Left: they are just the nodes that the new ideological malware is running on. It's not who's saying a thing that matters, it's what they're saying, and too often Mr Cohen's analysis seems to focus on 'bad people' rather than 'bad ideas'. This weakens his argument because bad people can always be dismissed as unrepresentative, and indeed they often are unrepresentative. For instance, he cites disgraced communist activist Gerry Healy, presumably as an example of the Left's bankruptcy. But, as an old-school communist Healy belongs to the old Left that Mr Cohen claims was better than what we have now. Furthermore, by citing such a bad apple Mr Cohen falls into the favorite error of both the new Left and the extreme Right: generalizing about an entire group from its worst members. If this isn't the intention, then why introduce us to Mr Healy at all? Gerry Healy seems to be an ideological parasite: someone who adopts a position in order to increase their personal power and social status. His reign of terror thus seems to be the career of an individual sociopath that could take place in any political community, and thus says nothing about "the Left". An argument could be made (as with sci-fi's social-justice-troll "requires_hate") that Healy gained his power by hacking a broken ideology, but Mr Cohen fails to make this case. Thus one is Left with an impression of a Leftist clique who are victimized by a manipulative monster, but who are perhaps blameless themselves. And Gerry Healy (born 1913) is a problematic choice because he's old Left and ancient history. The book is subtitled "How the Liberals Lost Their Way," and clearly this loss of direction must have happened long ago if we're taking Mr Healy as an example. But Mr Cohen goes further when he exhumes Virginia Woolf (born 1882) for a show-trial. Ms Woolf, we are told, was a 'screaming snob'. This may have been the case, but I feel it's unfair to compare her to the new Left. In a passage of her extended essay, "A Room of One's Own" Ms Woolf recalls being shooed off the grass at her university campus by a 'Beadle', because only male fellows of the university were allowed to walk on the grass. If I'm recalling this correctly (it's been a while since I read it) she draws our attention not only to this injustice, but also to the point that many people, including many men, could not even walk through the gates and onto the university grounds. It's a moment of heightened political awareness in which, via Ms Woolf, we see The System (tm) and realize that the great majority of people, of all races and genders, are somewhat oppressed by it, and that Ms Woolf is even better off than most men, and she's still oppressed. This woman is my kind of 'screaming snob' and is someone whom I could be an ally of, because she recognizes the issues of someone from my class background, and I recognize her issues, and so we could work together. This reciprocal worldview is light-years different from the modern 'social-justice' viewpoint in which the agenda is "Be my ally and help me with my issues, and then when my turn comes to help you I'll stab you in the back, denounce you for your 'privilege' and cast you aside with all the other fools who have outlived their usefulness." The social-justice new Left is a rich-person's weapon where they can deny that anyone else's issues are relevant or even real. When these people call for you to be their ally they expect the 'alliance' to be a one-way deal in which you help them for no return. I do not think Ms Woolf would have much patience with these people for long, 'Screaming Snob' or not. But perhaps I'm misreading/misremembering Ms Woolf. Still, even if she were a manipulative sociopath like Gerry Healy, I don't think there's much point in bringing her up as an example of anything. These people are so ancient they're rendered in black-and-white, or even sepia, and I don't see what use they are to a discussion of what's gone wrong with the Left in the 21st century. Unfortunately Mr Cohen fails to spend much time dealing with the real villain of the piece: a new ideology born out of our universities that argues that 'rights' are in fact 'privilege' and that "there's no such thing as racism towards [insert target group here, white people today, someone else tomorrow]." Actually, of course, this is not a new ideology, as anyone paying any attention to the new Left will note that it has certain characteristics: Firstly, and most importantly, it blames one subgroup of humanity for everything and claims they're all involved in a conspiracy (this time it's white men, although sometimes it's Jewish people ('Finance', 'Zionists') again). Secondly it practices 'moral exclusion' towards that subgroup, claiming that "there's no such thing as racism/sexism towards whites/men" and thus declaring open season on them. It's also strongly authoritarian and seeks to suppress all dissent (note all the voices recently that have been declaring 'free speech' to be a problem and a weapon of privilege). It stirs up moral panics in order to create support, and does this mostly by generalizing from the bad actors within a group to the entire group, claiming that the whole group is essentially evil. This is the oldest political model in the book, and we have a name for it, it's called fascism. And if you doubt me on this, compare the rhetoric of the New Left on white men to that of the extreme Right on Muslims. If you try to point out "Not all men" to a modern Lefty, you'll get the same reaction as when you try to convince a fascist that "Not all Muslims". You get the same reaction because they're running the same model, just with the target group changed. You'll even see that much of the language is the same. One might argue that whites and men are not particularly at any risk, especially the latter group. My own experiences and those of others would seem to disprove this claim, and I don't see any reason why whites can't be the next market-dominant-minority, like the Jews in the 40s, who get targetted for ethnic cleansing, particularly as the Pax Americana declines and the world becomes more fractious. However lets accept this claim for the sake of argument. The consequences of this shift in Left-wing thought are still disastrous. Firstly, they are going to be disastrous for the Left. White men, and particularly working-class white men, are going to jump ship from the Left for any other political movement that will have them. Indeed, we're seeing the rise of new political groups that build on white, male disenchantment: many of these groups are themselves rather alarming. Many white women will also leave, as they feel a stronger commitment to their sons, brothers, fathers, husbands and male friends, than they do to feminist theory. Quite a few people of color are likely to abandon the Left too, as there's lots of them who are absolutely livid about the whole "There's no such thing as racism towards..." thing, as that's not what they feel they've been fighting for since forever. The Left has always had most of its support from the working-class, but the new ideology is a middle-class weapon that denies the very existence of the working class, claiming that, as in the words of one well known science-fiction author "White male is the lowest difficulty setting." This is, of course, and inherently Tory sentiment: if a white man is out of work or on the street, it must be his fault because he's on the lowest difficulty setting. It's no surprise to note that most of the new Lefties are desperately middle-class, and this new ideology is intended to serve their personal interests at the expense of the poor (not that I have anything against the middle-class, some of them are very nice people and many of them are as angry as anyone about what's going on, but too many have jumped into this new ideology feet-first). Secondly, and perhaps most importantly, the arguments laid out by the new Left will be taken and retasked to target other groups. Once you have made bigotry acceptable if it's backed up by an argument about 'privilege', you can target any group that you can claim is 'privileged' in some way. For a good rhetorician this means anyone. We saw this with 'requires_hate', who was using the anti-whites/men rhetoric of the new Left to attack whomever she liked, including women, trans-people, people-of-color, whomever. This 'New Left' ideology that's alternately called 'social justice' or sometimes 'third wave feminism' is the first form of argument I've seen that can overturn the 'Post Holocaust Consensus'. The 'Post Holocaust Consensus' is my name for the state of affairs that have existed since World War 2 in which we all (or at least most of us in the west) agree that all people are of equal value and deserve equal treatment. If you're talking about 'punching up' and claiming that there's "No such thing a xxxx-ism" towards any group, then you've rejected the Post Holocaust Consensus. You've also created an ideological framework that allows other people to argue against it. When this ideology gets deployed in real-world situations, the results are going to be bloody. This ideology is the subject that Mr Cohen's book should have dealt with, but unfortunately it doesn't to any significant degree. Perhaps this is a matter of timing: when Mr Cohen's book was written the enemy was still somewhat amorphous, and we had not yet seen spectacles like student's unions siding with Islamists to silence arab-feminist speakers like Maryam Namazie. Perhaps there were signs in 2007 that something was amiss, but it wasn't clear exactly what was ailing people. However, now things have moved along rather profoundly, and sadly Mr Cohen's book doesn't address the real issues of the New Left. It's a brave attempt, but it's a warning from someone who knows the threat is looming, but isn't quite sure what it is. 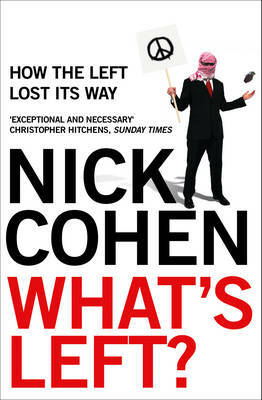 The book that will really address what's wrong with the modern Left is perhaps still waiting to be written, and perhaps Mr Cohen is the very man to do that. But he'd better hurry, because as the left is taken over by academic, wealthy-class entryists pushing a retooled version of fascism, the question put by the title of this book "What's Left?" is becoming ever more pressing, and the answer now is 'not much'.